Christopher Staknys performed on Show 291, recorded June 2014, at age 17. Christopher Staknys (piano), 17, is from Falmouth, Maine, where he graduated from Falmouth High School in 2013. 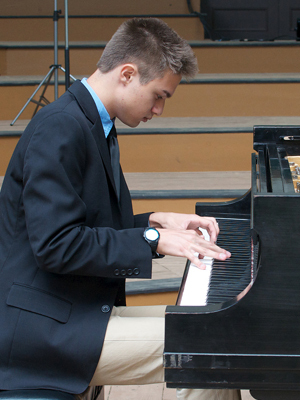 He studies music with Roberto Poli at New England Conservatory’s Preparatory division in Boston, Massachusetts. He has won numerous competitions including ARR Piano Inge Holleck Prize, NEC Prep Concerto, Ocy Downs Piano, MMEA Composers, Bagaduce Young Composers, Bangor Symphony Concerto, Metrowest Concerto, Steinway Piano, Pinetree Piano, Music Without Limits Concerto and Solo international Competition in Lithuania. His original composition “Congo” was premiered by the Portland Symphony Orchestra. Outside of music, he has varied interests, including computers and technology, reading, and cats.